This weekend’s out-and-about eats saw us trading in the newest hotspots (like Three Bears Kitchen) for some slightly more established venues. Friday lunch was a farewell for a colleague at The Lucky Hotel. 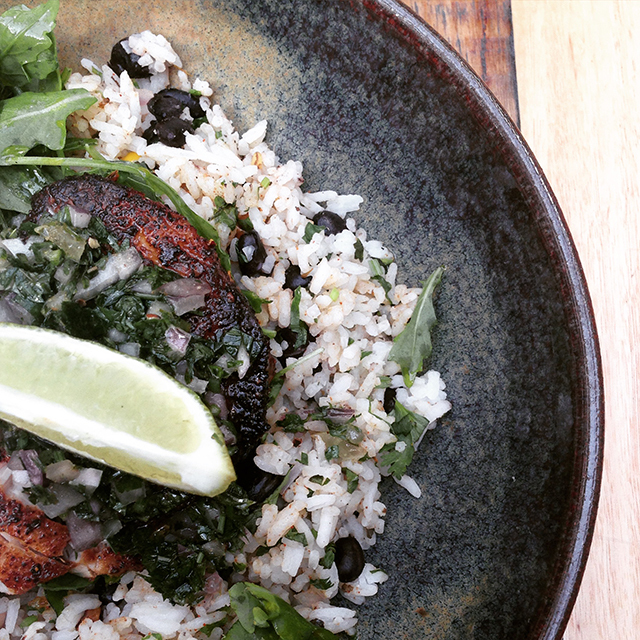 I devoured this healthful & totally photogenic blackened fishy over cajun rice & topped with a scoop of herby goodness. On the walk from The Lucky back to the office, I may or may not have popped into Hello Naomi with a couple of the girls. Salted caramel & peanut butter brownie sandwich: can you blame us?? So worth it. 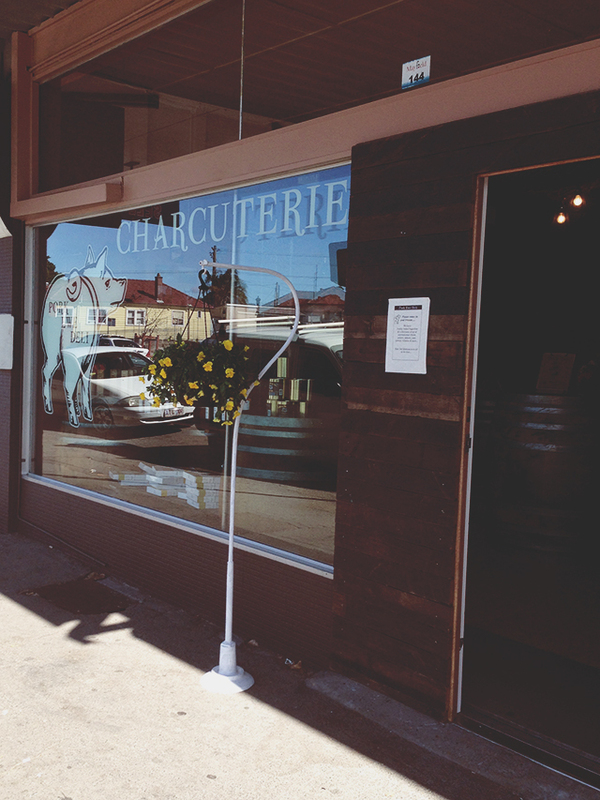 After a cracking session at Gritshed, I swung by home & collected Michael for brunch at Fortunate Son in Hamilton. I’ve been for a Friday night beverage and bar snack but after hearing great reviews, we still hadn’t made it in for a proper meal. This braised short rib hashbrown with rocket, tomato relish & poachies lived up to the hype and fuelled me up for a long walk around the beach. Sunday mornings usually see Michael hit the yoga mat at Ashtanga Yoga Newcastle while I do the rounds at the farmers’ markets. 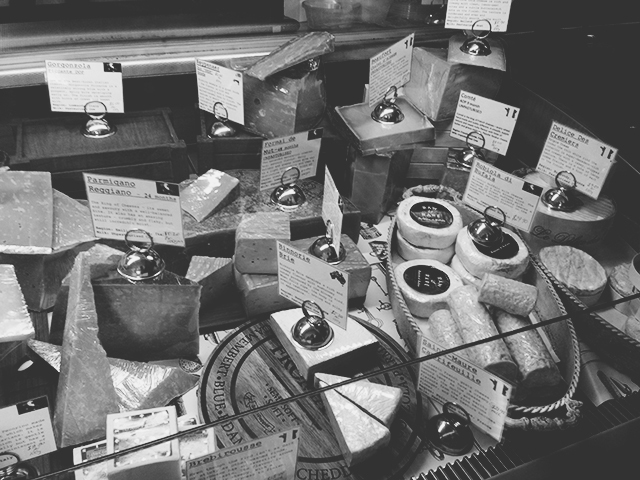 I love getting in early and wandering about, picking out the best produce. It’s so much fresher, more delicious and doesn’t cost me any more than the often imported and not-so-great options at the supermarket. After we finish our activities, we head out for breakfast. This is the Savoury Mince at The Edwards. Most morning visits to The Edwards involve the are-you-getting-the-mince-or-can-I discussion. I won out this time with Michael enjoying the eggs & baked beans instead. It was a delicious weekend! 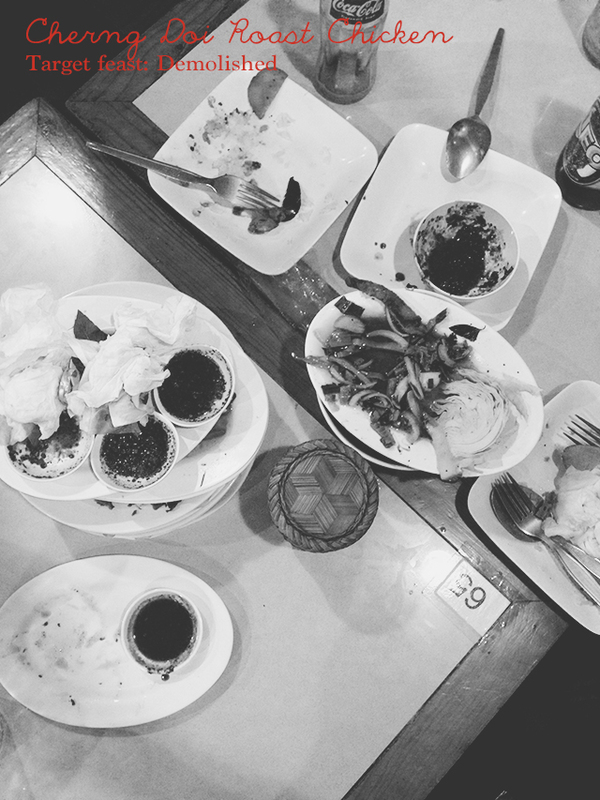 What were you feasting on? So let me just join everyone in saying: how on earth is it now February?! The year is flying already! 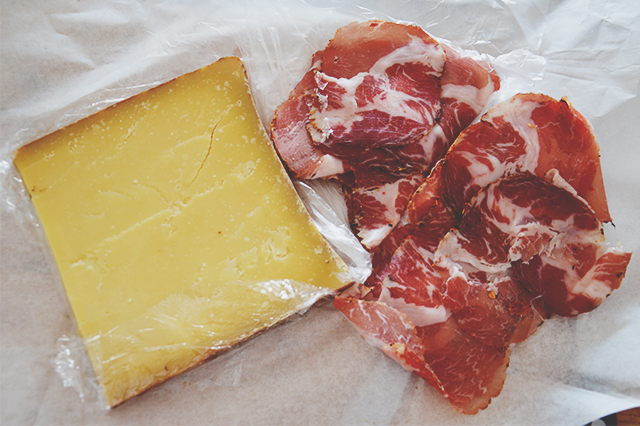 In between the daily grind and getting stuck into wedding plans, there have been a few foods of note. 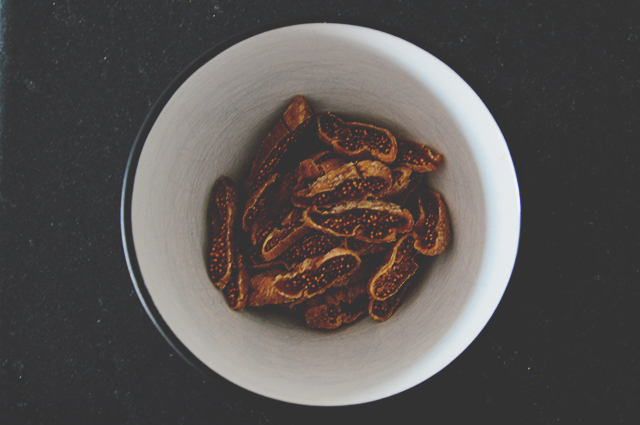 After making the seed crackers from Lorna Jane Clarkson’s Nourish over Christmas, I couldn’t wait to get another batch on the go (for those playing at home, I use buckwheat flour instead of spelt & mix in dried herbies). 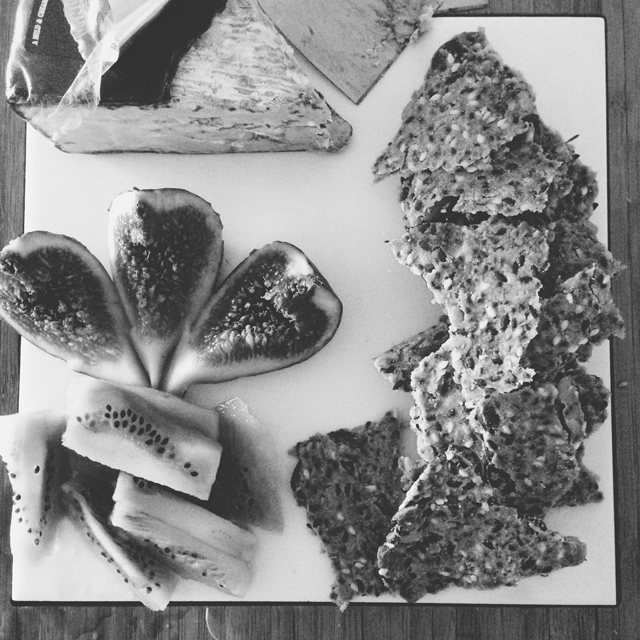 Accompanying the crackers for a happening happy hour is a cheeky wedge of blue cheese and some fresh fruit. The Edwards is an all-day dining cafe/restaurant/bar which, not too long ago, was an industrial laundry. Serving deliciously home-style food, this place is a regular haunt of mine for brunch, lunch, dinner, coffee… Any time really! 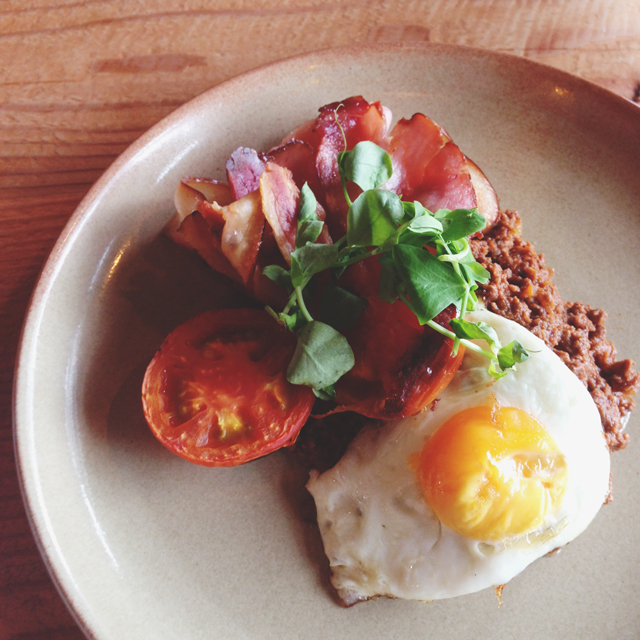 This is the Savoury Mince (sans toast) and it is both a delicious brunch and a foolproof hangover cure. 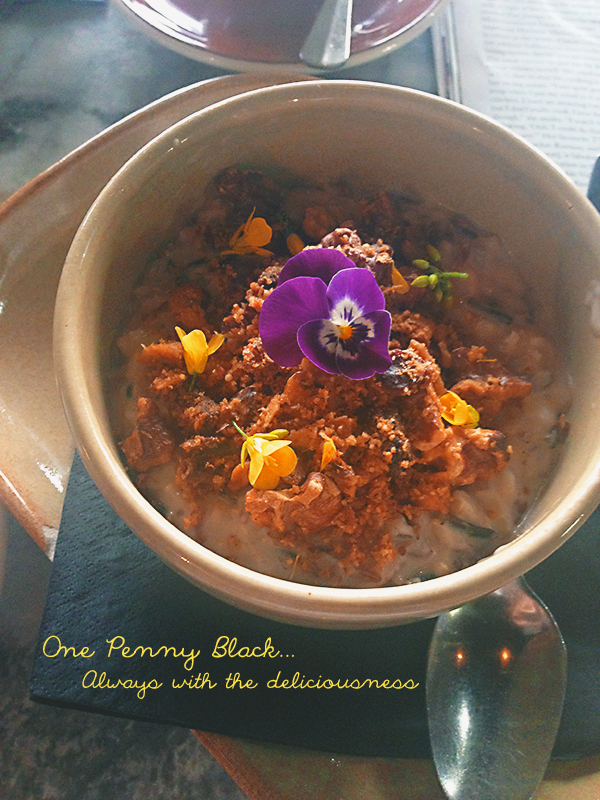 A forever favourite, One Penny Black is a coffee-obsessed cafe with excellent eats. 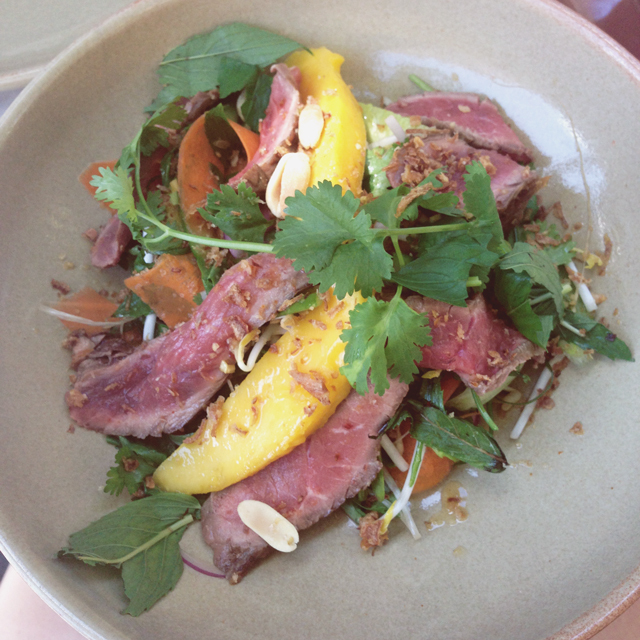 I’ve raved about them before (and if you follow me on Instagram you’ll probably know the extent of my fandom) but this Thai Beef Salad was a simple and delicious weekend lunch, especially when washed down with an iced long black. I’m always surprised when food from a festival or a big event is actually good. 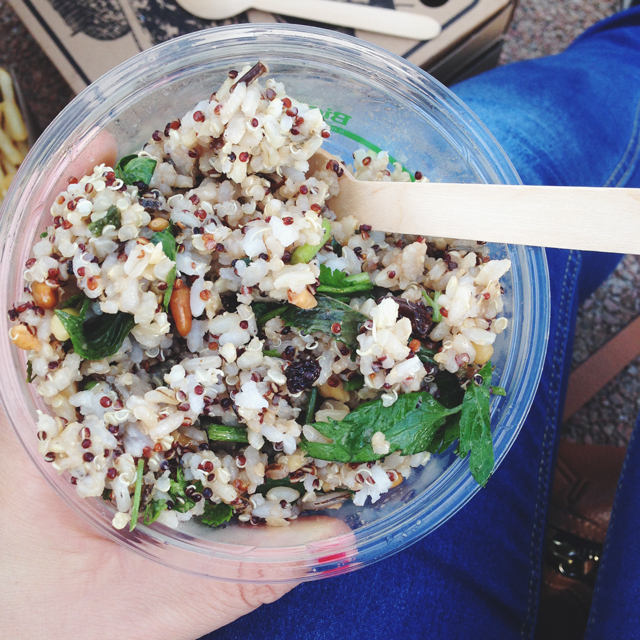 This rice salad (with dried fruit & fresh herbs) was an unexpectedly tasty carb-up I had while waiting for Eddie Izzard to take the stage on the Sydney Opera House steps. He. Was. Hilarious. And given plenty of people gave me blank stares when I mentioned his name, if you don’t know who he is, go watch this and this and give him a good Google. The next morning, we schlepped up to Pablo & Rusty’s for breakfast and coffees. 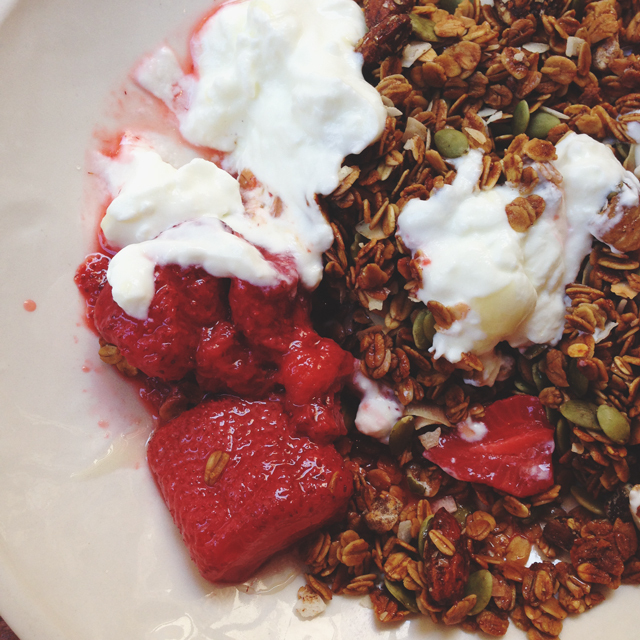 I settled on this toasted granola with sheep’s milk yogurt, truffled honey and vanilla poached strawberries. Michael went for the epic Rusty’s Breakfast Brioche, which was stuffed with organic free range bacon, banana jam, labneh, sorrel & dulce de leche. Craziness! Here’s to a delicious February! Yay! 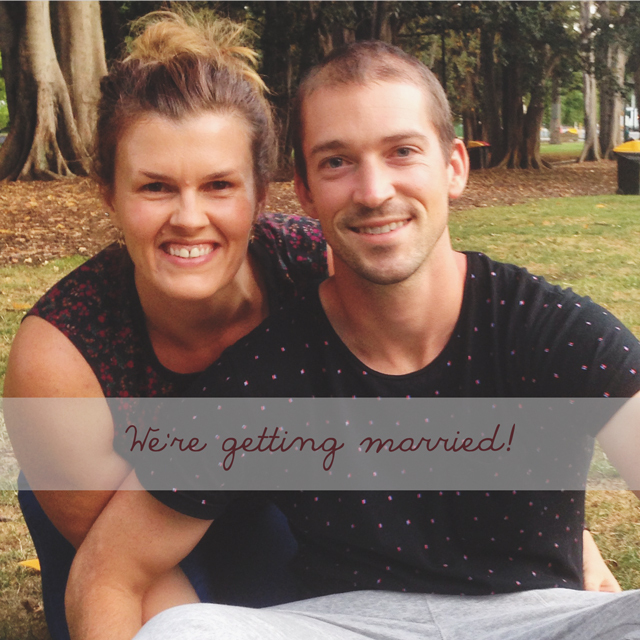 Michael proposed as we were strolling around Melbourne’s King’s Domain Gardens and I excitedly accepted! Stay tuned for further developments & planning 🙂 For now though, back to your regular scheduled programming. 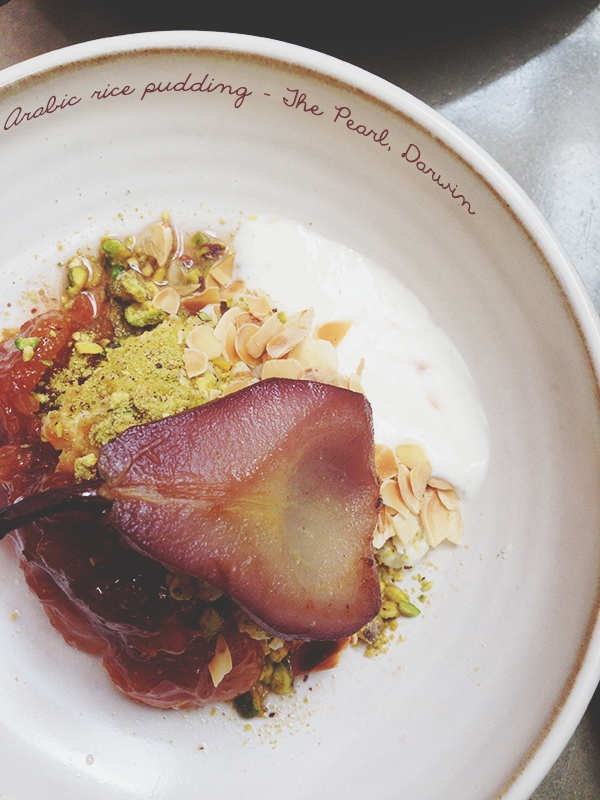 While we still made it to our favourites, our eats in Melbourne on this trip took us to a couple of new spots. 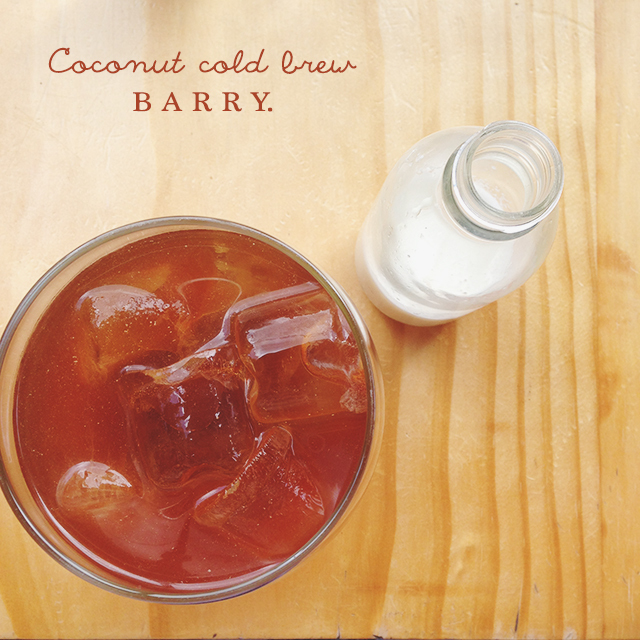 One of the standout new-to-us eateries was BARRY. A short tram or taxi ride (we recommend tram if your taxi driver smells anything like ours did *shudder*) away in hip Northcote, BARRY has a creative menu full of inspiring food and drinks which are well worth the 20-minute wait for a table. Living in the coffee hub of Newcastle, it takes some impressive bean work to get us excited but this coconut cold brew was a winner. With an accompanying bottle of coconut milk for a dash to taste, it’s a refreshing take on caffeine. It’s not all about the coffee here though: once the food landed on the table, it’s easy to see why this place is packed to the rafters at brunch o’clock. 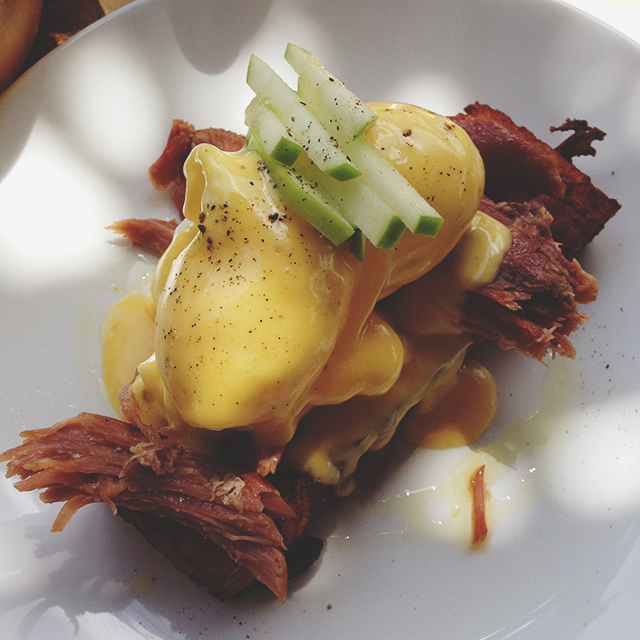 Benedict eggs, slow braised free range ham hock, apple cider hollandaise and granny smith apple on a potato hash brown; don’t mind if I scrape every last morsel of it from my plate! 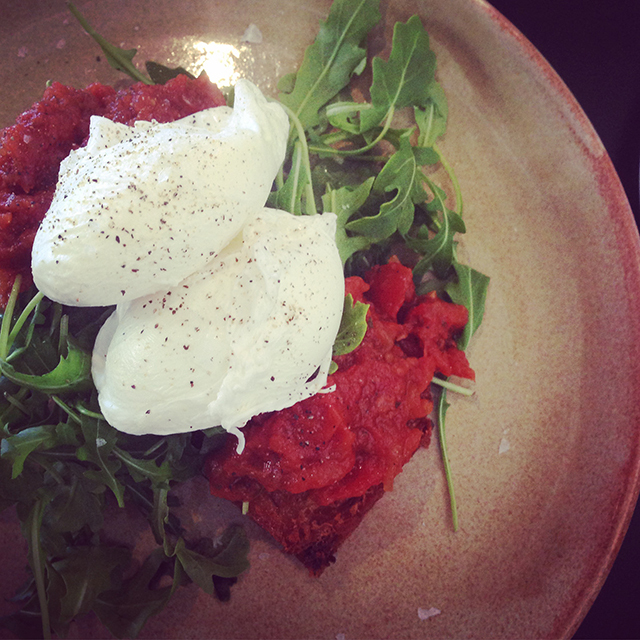 Anyone cafe can do an eggs benny but this one was next level – creativity and quality produce are a killer combination. Cumulus Inc is a long-standing breakfast favourite of ours in Melbourne but, while we’d sampled the wine list in the classy-but-cosy bar upstairs, we hadn’t been in for a dinner service. With no room at the inn downstairs, Cumulus Up had four stools free at the bar overlooking the kitchen for us and our two friends – jackpot! 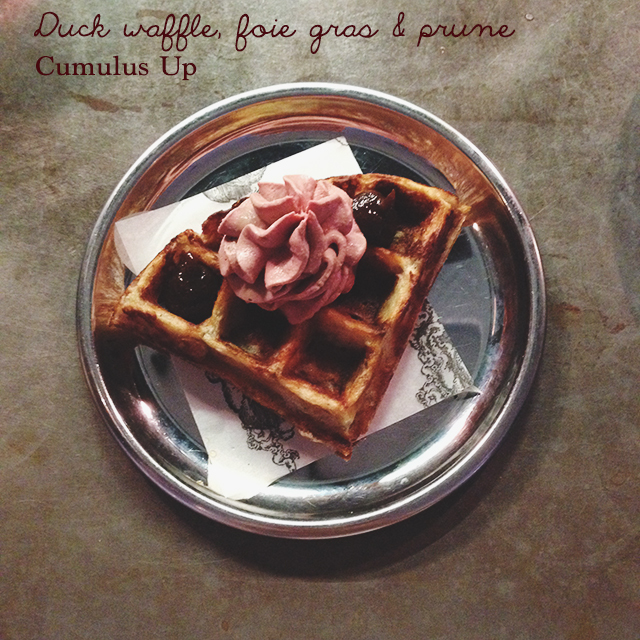 Now I know how much I love duck waffle, foie gras and prune. We feasted on most of the menu – including (but definitely not limited to) the steak tartare, the ricotta dumplings, the roast potatoes – and loved every mouthful. 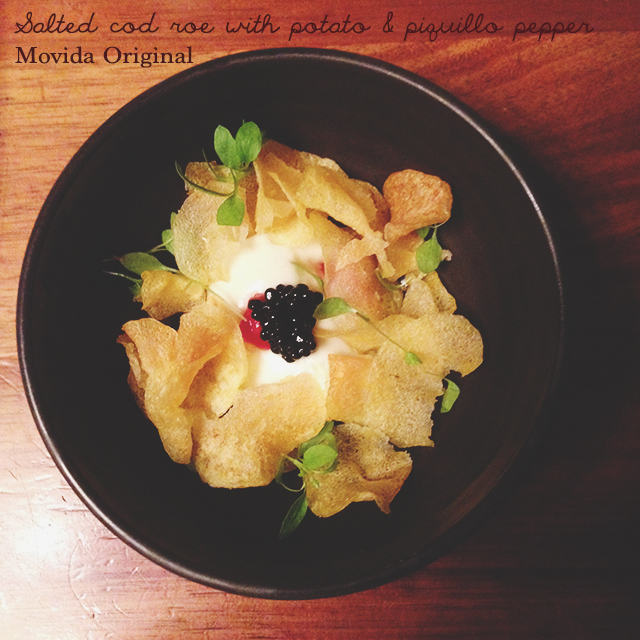 Another favourite is, of course, Movida. It was lovely to share dinner there with our uninitiated friends. We revisited a couple of dishes (the menu doesn’t change a whole lot over time) but this Ajoarriero – salted cod roe with potato and piquillo pepper – was a delicious tapa I hadn’t tried before. And you can bet I kept it all to myself. 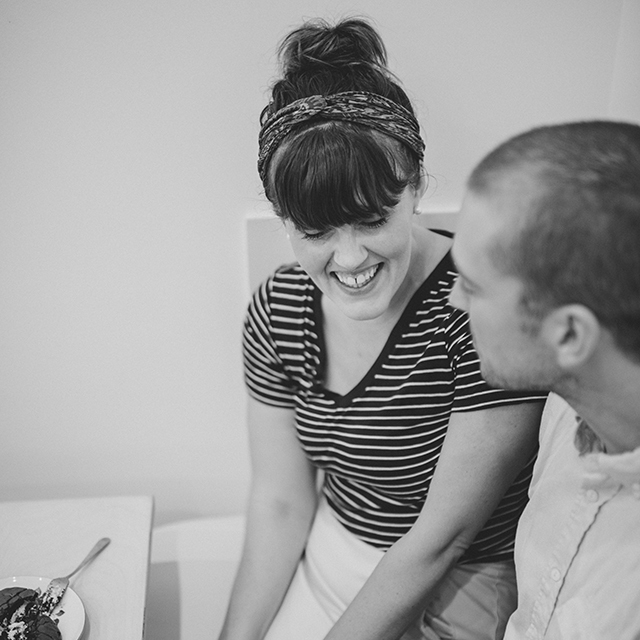 We totally indulged with the dessert menu too. I managed to post the almond parfait with lemon curd ice cream on Instagram before we forked in. Fun fact: Aussie model Abbey Lee Kershaw was dining with us at Movida. Sure, she was at another table, but we knew who she wished she was chowing down with. And sneaking in as the last entry in this round of Week of Eats, we have takeaway long blacks from Brother Baba Budan (left) and Cup of Truth (right). 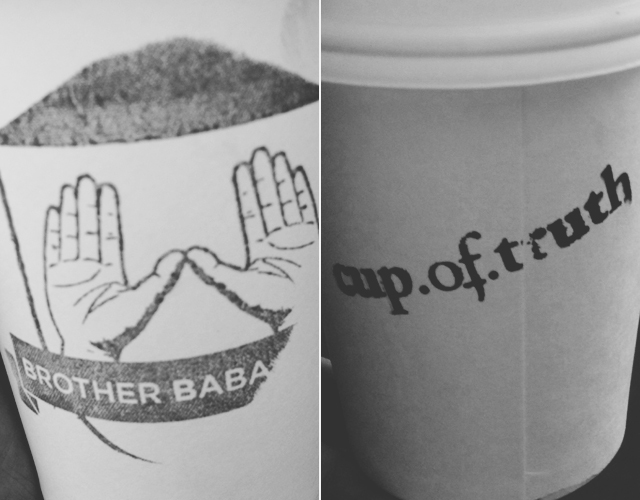 Both coffees were quality but bonus points go to Cup of Truth for the hidden location – I had no idea where Michael was taking me when we were getting to it! It’s tucked away in the Degraves Street subway station so don’t rely on your GPS knowing where the devil it is. Hope you had a fabulous festive season! 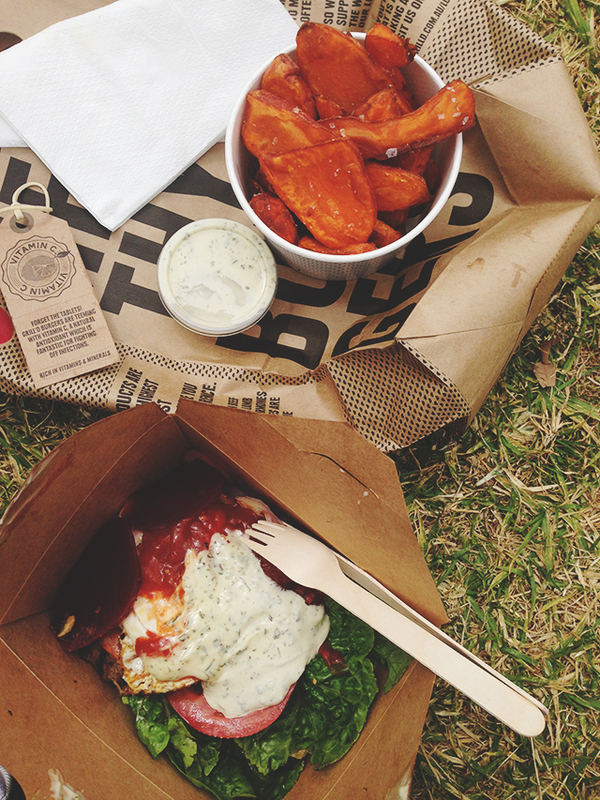 If ever there was a week of eats worthy of a Week of Eats post, this most definitely would have to be up there! 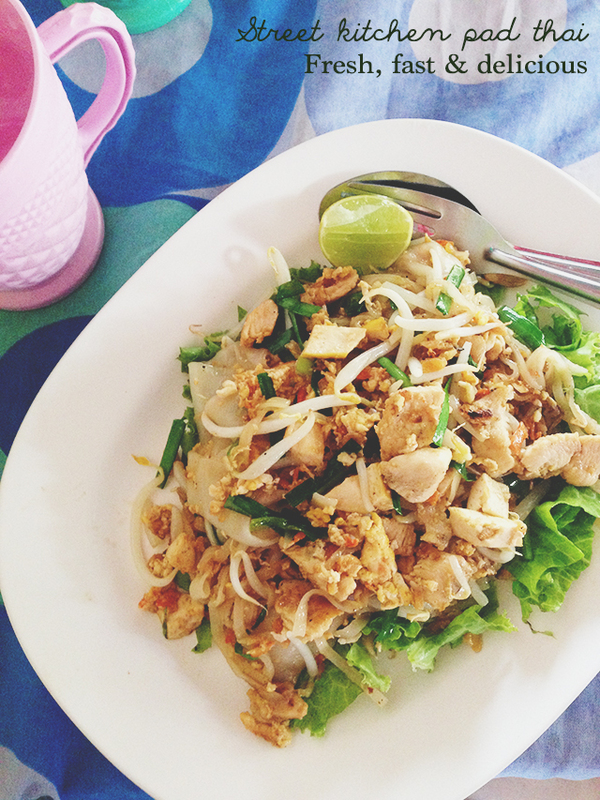 So as I mentioned in my Chiang Mai cooking school post, some of the best food I ate was what I cooked for myself. But, lets be honest, that’s a big some in a very delicious week! I have a friend who is mortified by even the concept of a three-second rule and slathers hand sanitiser on religiously before meals. It is these friends that will struggle in Thailand. 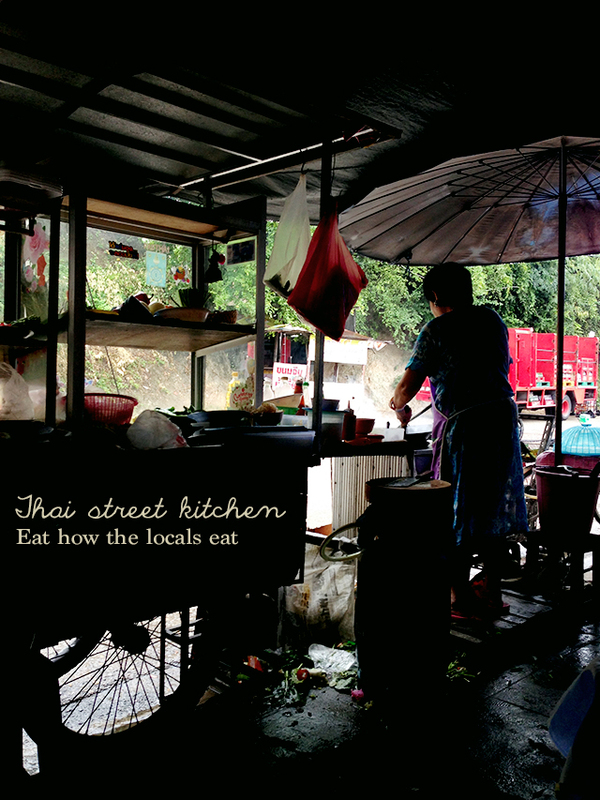 I took the above photo while waiting for the below food… and that pad thai was an absolute ripper. While it can feel a bit strange to eat food from a kitchen like this, if it’s good enough for the locals, it’ll be perfect for you. When I was in China for a few months in 2008, those of us that ate local food avoided any hint of an off belly. Others that tried to find western-style food for most of their meals were the ones who struggled to maintain their delicate digestive balance. On our first night in Chiang Mai, we weren’t quite sure where everything was and we were quite keen to find whatever food was easiest so we could just go sleep away the plane trip. We found a busy street-side restaurant (busy with locals is the key to success!) 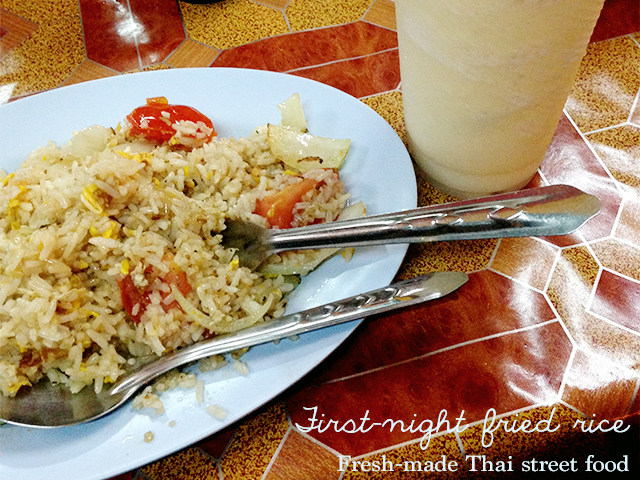 and I chowed into this simple fried rice and a mango & coconut milk smoothie – it was heaven to our bleary eyed selves! I’d looked up a few cafes before we left on the trip and one that kept coming up as a winner was Free Bird Cafe. 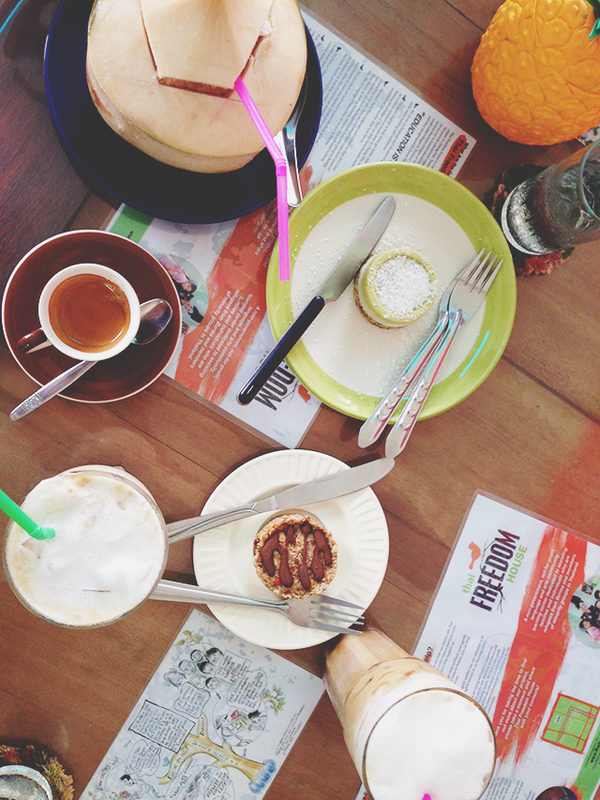 A fundraising arm for the not-for-profit Thai Freedom House, this cafe had vegan treats, coconut milk smoothies and coffees. Everything was delicious & pretty creative too: Michael got a coconut that came with an espresso which you’re encouraged to tip into your coconut. He was impressed! The Inpoo Food Shop became the #PNTHAILAND14 headquarters by the end of the trip. It’s where we had day 2 of our cooking classes and was across the road from our accommodation. Som is one talented lady in the kitchen. 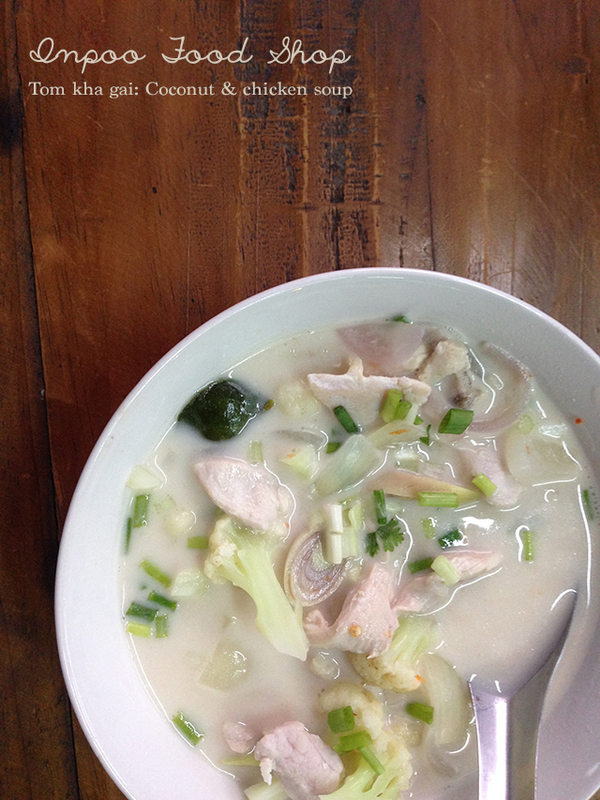 We’ve since tracked a tom kha gai down at a Thai restaurant back here in Newcastle but it just makes us miss Som’s version. Another notable restaurant was Cherng Doi Roast Chicken. 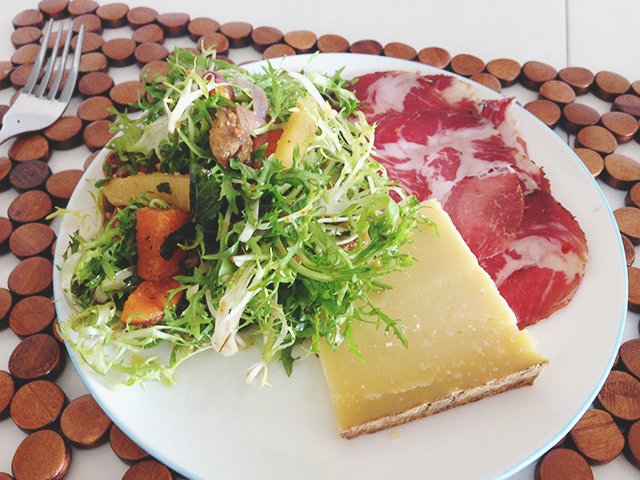 Recommended by Nom Nom Paleo, this restaurant was the host of an all-in culinary ninja feast. I think a lot of chicken was probably harmed in the feeding of our group. It went to a good place though, a good delicious place. 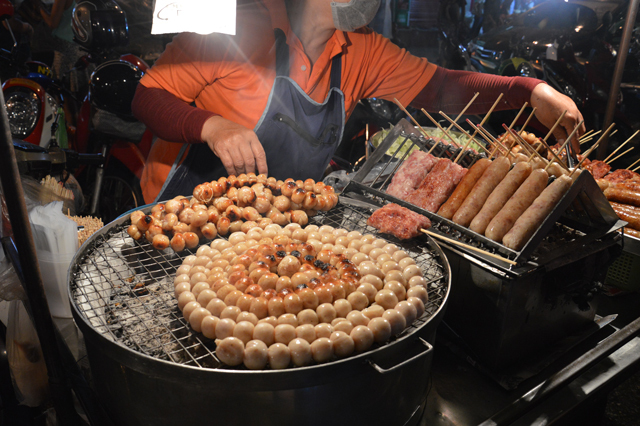 Given we were in Chiang Mai at the same time as the Yi Peng Lantern Festival, we got the opportunity to sample even more street food than what would normally line the streets of downtown Chiang Mai. Meatballs, grilled chicken and sausages galore were all on offer and made for good dinner fare. 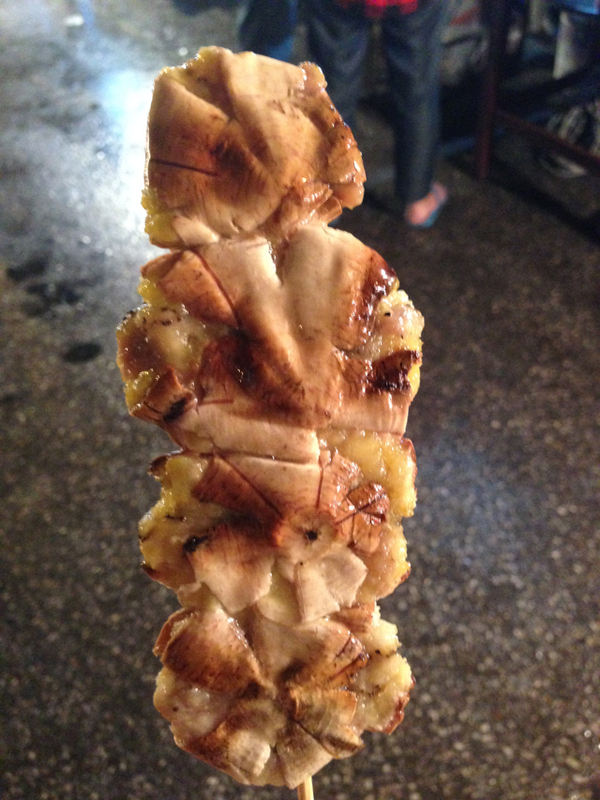 But my favourite of all the things on skewers in Chiang Mai was undoubtedly the grilled banana. Served with a take-it-or-leave-it creme anglais dressing, these bananas were fascinatingly tasty – not squishy, barely caramelised and not too sweet. Food van people of Australia: get on to these – I want to eat them when I wander the markets here too! Breakfast is my favourite meal. There, I said it. Like a mother declaring the favourite child, here I am announcing where my heart truly lies – let’s hope karma doesn’t make me ruin my dinner now! I’ll start this round up off with the only brekkie here that I didn’t make: a beautiful vegan rice porridge from my favourite weekend haunt, One Penny Black. Accompanied by a long black and a good tabloid newspaper, it was a delicious way to start off my Sunday! Michael’s doing a 10,000 steps challenge with his work at the moment so after we chowed this breakfast down, we went for an epic walk. So epic, in fact, that he doubled his goal for the day! Three, sometimes four, mornings per week I train at Gritshed before the sun has even sensed that its alarm is about to go off. I don’t eat before I work out so by 7am when I get home, I’m ravenous! I’m never satisfied with just a smoothie, especially on a training day, so I decided to start serving one up with some quick fried eggs topped with a scoop of homemade sauerkraut. This is a fun colourful breakfast that is guaranteed to keep my belly happy. It’s been almost a year since I cut out the grains and dairy but I’ve recently been introducing buckwheat into my morning meal to great success. I find soaking it overnight & then warming it up with some creamy coconut or almond milk in a porridge is a beautiful way to kick into gear on a cold morning. 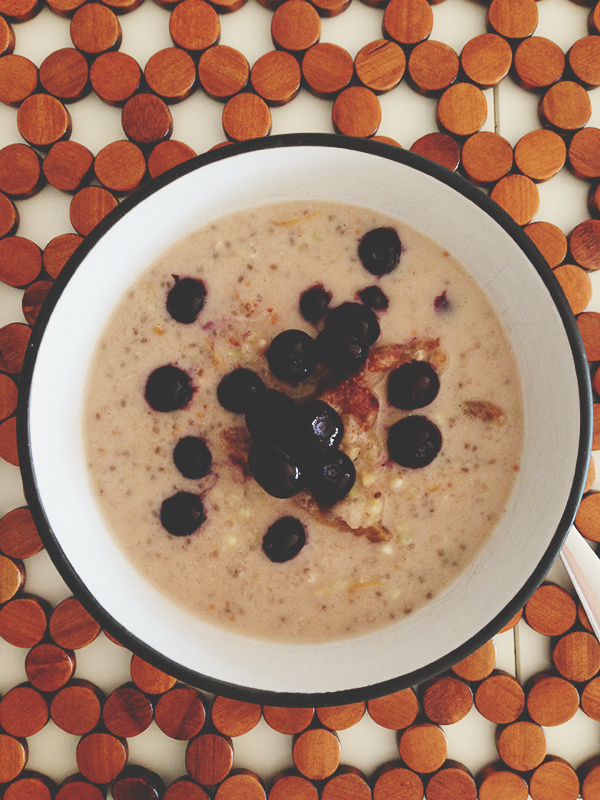 Give my dairy-free buckwheat, chia & maca porridge a try for yourself! If I have oven space & a few minutes to spare on the weekend, there’s a pretty good chance you’ll find me putting a batch of granola together. I always experiment with whatever flavours I have available. This one was made with coconut flakes, buckwheat puffs and a few other scoops of fruits and seeds. If you haven’t made one for yourself before, give my Grain-free fig and hazelnut granola a crack and then start experimenting. 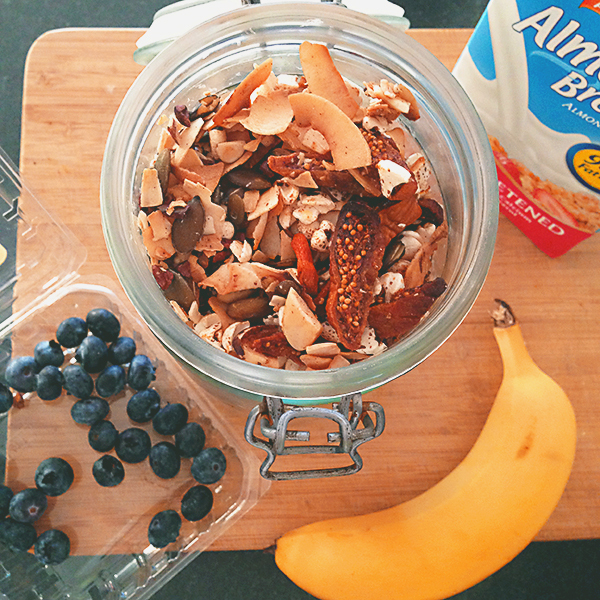 Want some more breakfast ideas? 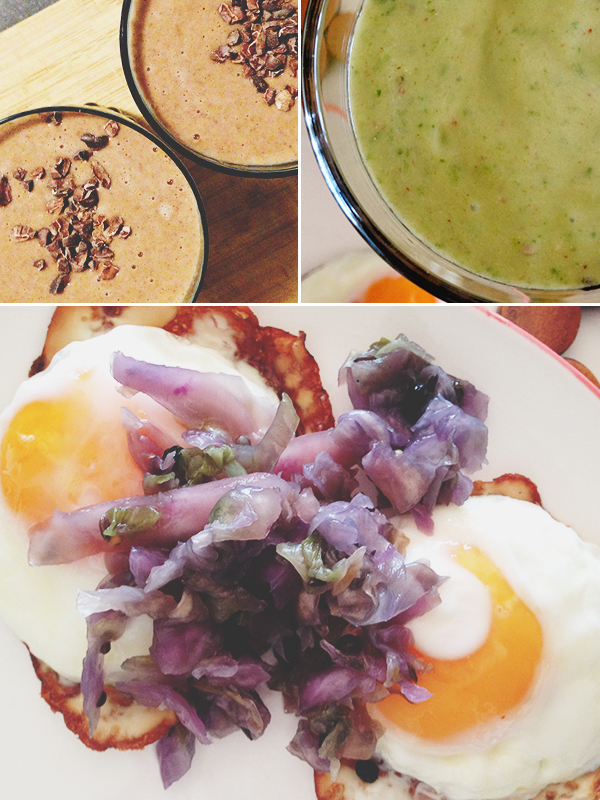 Here’s my round up of squeaky-clean paleo breakfast options. What’s your favourite thing to have for breakfast? While I love my eggs & savoury brekkies, I’m really enjoying a good porridge lately – I blame winter! A guy I work with can’t even stand the thought of breakfast – that could never be me! As I type with frozen finger tips, I definitely know I’m back home in the winter weather & no longer holidaying in Australia’s sunny ‘Top End’, Darwin. We flew in late last night & are still stepping over half-emptied bags and laundry piles. Until I get all my photos sorted & some more thoughts organised, I thought I’d share some of the stand out food moments from Darwin’s restaurants, cafes & much-loved markets. 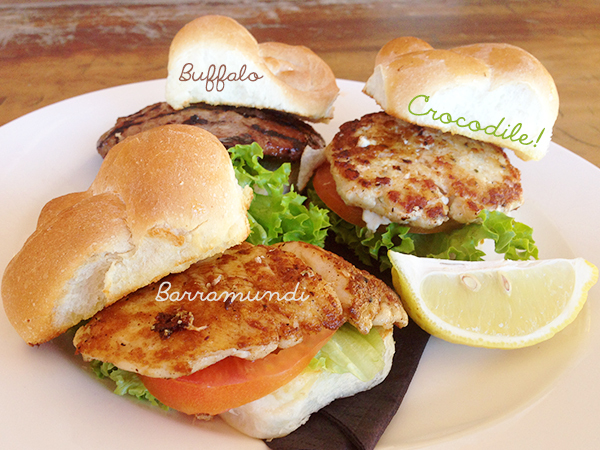 It has to be said: it’s hard sticking to our primarily Paleo eating template when there’s crocodile burgers to taste. This trio from the infamous Humpty Doo Hotel was our inspired grub of choice en route to see the jumping crocs – pics to follow, don’t you worry! The Asian influence on the food scene in Darwin is particularly noticeable at the markets which pop up throughout the surrounding suburbs right across the weekend in the dry season. This laksa most definitely lived up to the recommendations we had from both locals and previous travellers. 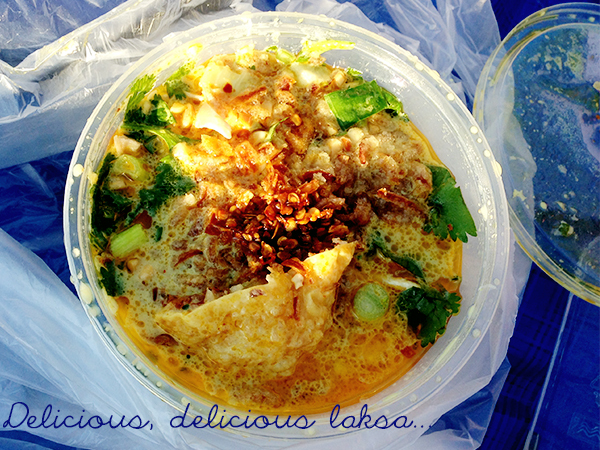 I got this at Mindil Beach Markets but apparently the favourite laksa-vendor to many is to be found at Parap’s Saturday markets. 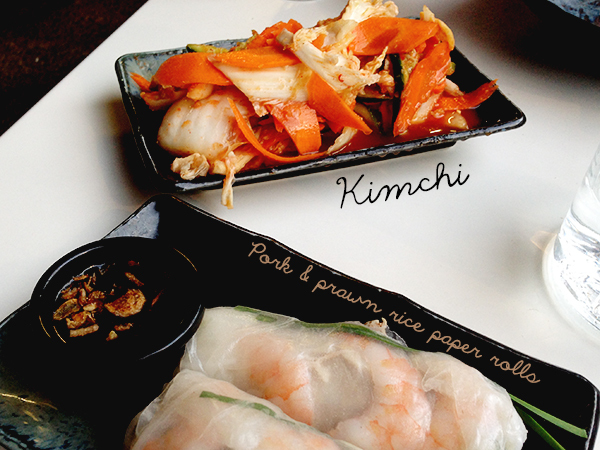 The Asian influence (especially South East Asian) is not limited to market food – there are plenty of restaurants in Darwin dishing up rice paper rolls, creamy curries and spicy seafood. Chow was a notable favourite. Good coffee in Darwin is notoriously hard to find but newcomer The Pearl offered one of the better beans (we ranked it 2nd behind Pierre’s long blacks at Rawgasm Cafe in the mall). 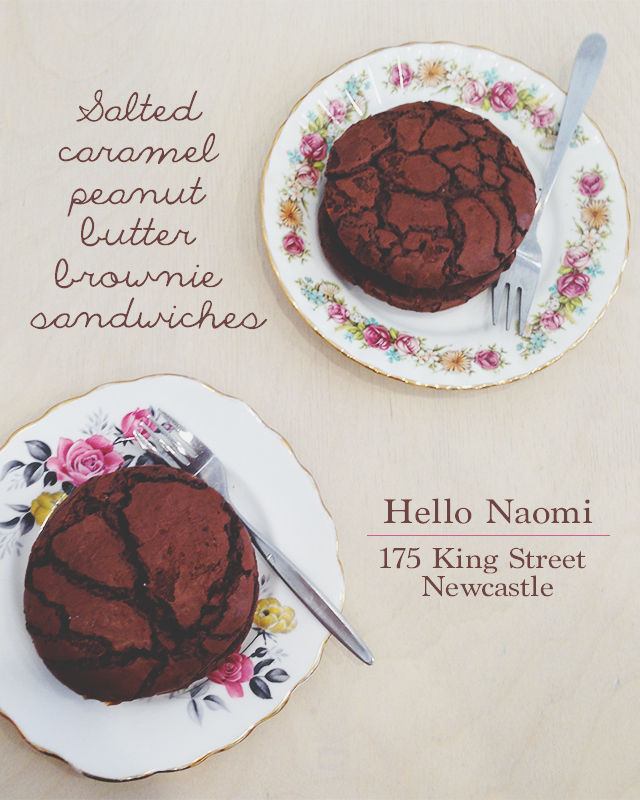 Being from increasingly cafe-saturated Newcastle though, we are pretty snobbish with such things! 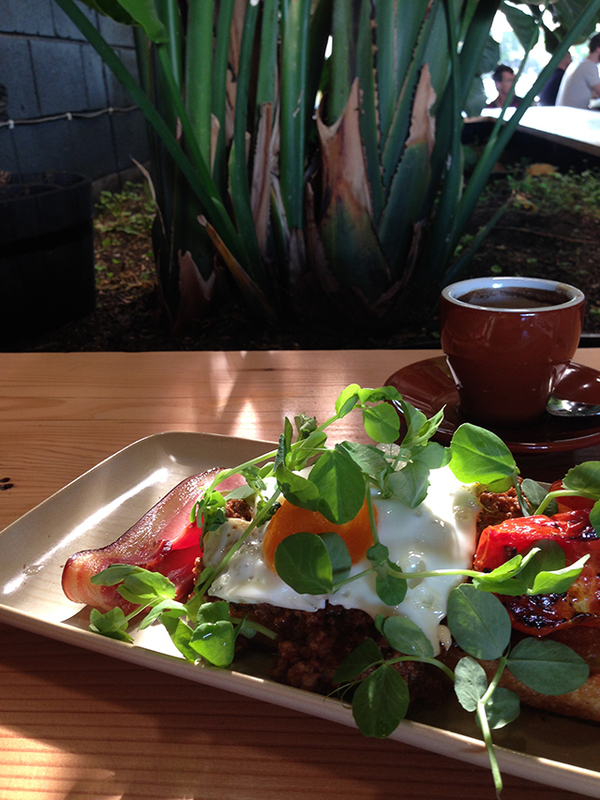 While the coffee was certainly above the local average, it was the inspired cafe food that grabbed our attention. This Arabic rice pudding was a feast for the senses. Have you been to Darwin? What were your thoughts on the food options? I’ll be sharing more from our Top End adventure over the coming week – stay tuned! Every Sunday, I plan out & shop for the majority of our meals for the week ahead. Here’s the best-of last week. To kick things off on this rainy Sunday evening, as promised here’s the Creamy Chicken & Tomato Pasta from Let’s Eat Paleo by The Merrymaker Sisters. 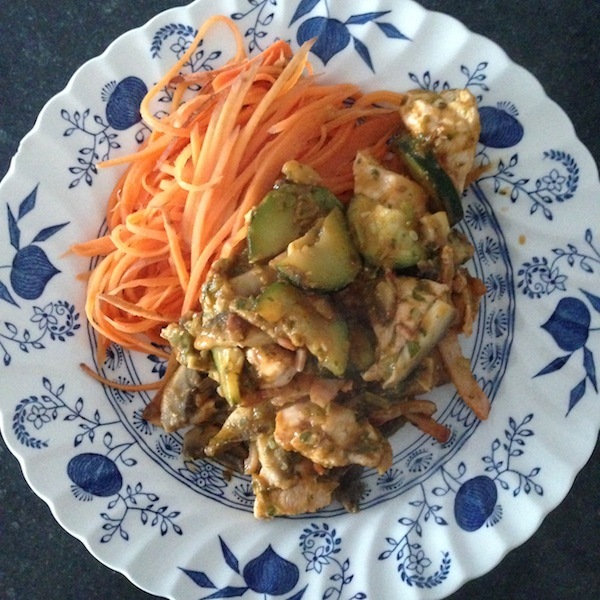 I added in some zucchini & served it with sweet potato noodles & it was super tasty. 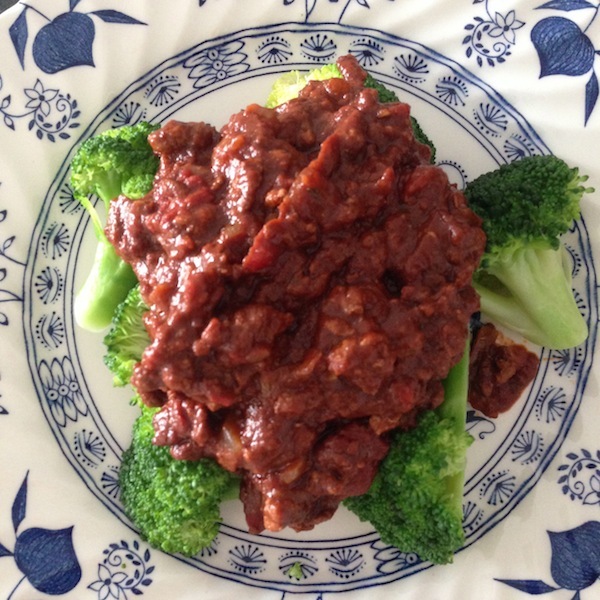 Quick & easy to put together, this dish has already made the menu again for this week. The recipe was for four people so we both enjoyed leftovers for lunch the next day. 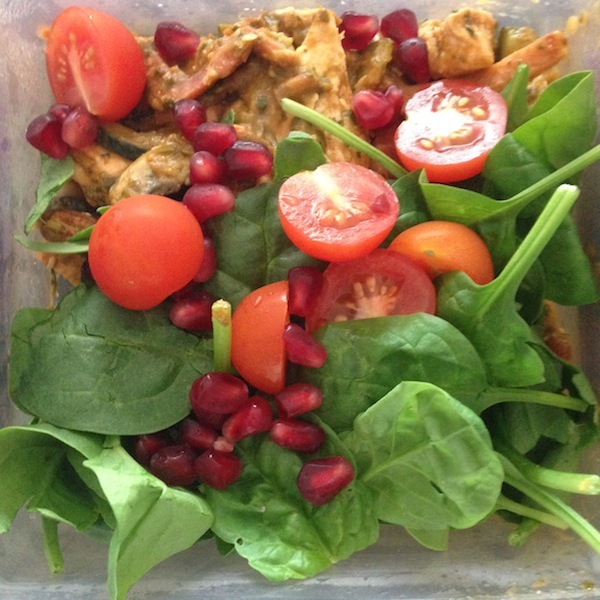 A few cherry tomatoes, a handful of baby spinach & a sprinkle of some leftover pomegranate seeds & it was the second best lunch I had all week. 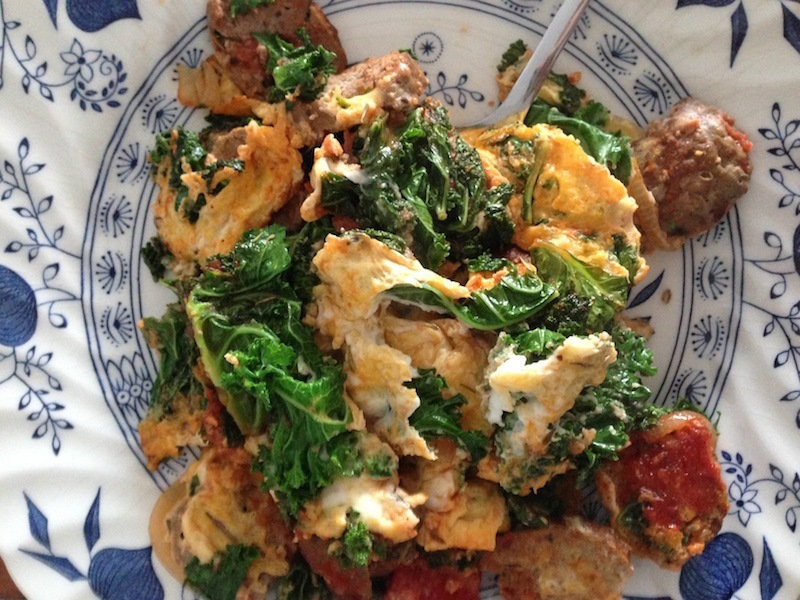 Breakfast seems to be the biggest gripe new-to-paleo people post about online: “How do I do breakfast without Pop-Tarts, Coco-Pops & Wonderbread?” Behold the whatever-is-in-the-fridge scramble: sliced up leftover tomato-y meatballs, a handful of kale & 2 eggs scrambled with a plop of coconut milk. I’d have that over some sugar-laden cereal any day! One of the best cookbooks of last year would have to be Jerusalem by Yotam Ottolenghi. We’ve made a lot of awesome dishes out of it & I was surprised we hadn’t given this particular recipe a spin yet. Braised Eggs with Lamb, Tahini & Sumac was an absolute ripper of a dish which Michael could not get enough of. 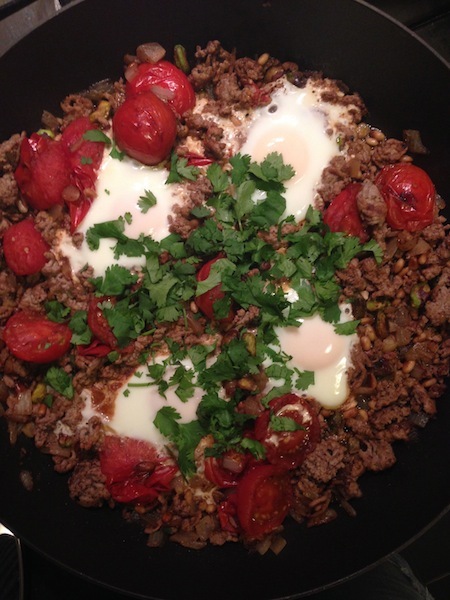 Toasted pine nuts & pistachios tangled with spiced-up mince & roasted tomatoes, topped with eggs: Sold. 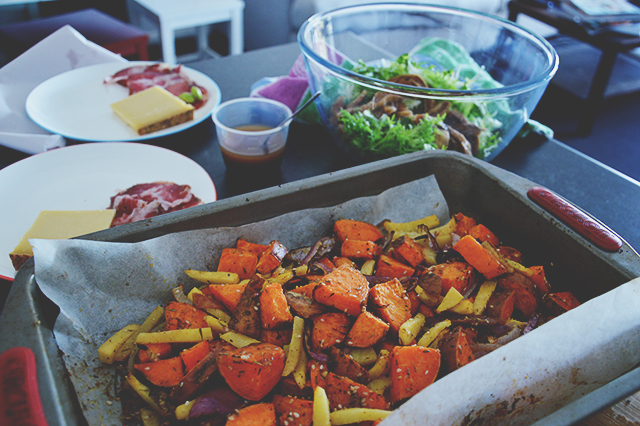 Hope you’ve got some delicious things planned for dinner at your place this week!